While orchard owner Meg Corey dreads the labor of manual irrigation to stave off a drought, her boyfriend, Seth, couldn’t be more excited about doing historic renovation on one of Granford’s oldest houses. Tagging along as he picks up supplies is supposed to give Meg a much-needed break, but the trip turns rotten when she almost trips over a dead body at an old saw mill’s forest reserve. But the body isn’t the only frightening discovery she makes. A mysterious insect infestation seems to have migrated to the area—one that could bring serious harm to local woodlands. And it's up to Meg to find out what’s behind this sudden swarm of trouble. 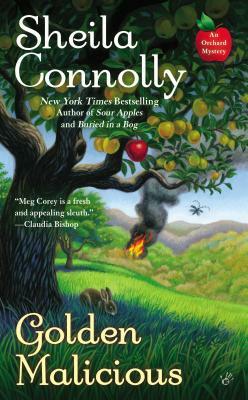 Sheila Connolly is the New York Times bestselling, Anthony and Agatha Award–nominated author of the Orchard Mystery series, the Museum Mystery series, and the County Cork Mystery series. She has taught art history, structured and marketed municipal bonds for major cities, worked as a staff member on two statewide political campaigns, and served as a fundraiser for several nonprofit organizations. She also managed her own consulting company, providing genealogical research services. In addition to genealogy, Sheila loves restoring old houses, visiting cemeteries, and traveling. Now a full-time writer, she thinks writing mysteries is a lot more fun than any of her previous occupations. She is married and has one daughter and two cats.